Another sunny day and another holo!!! This is easy to use, easy to apply and quick drying (about a minute for a coat). 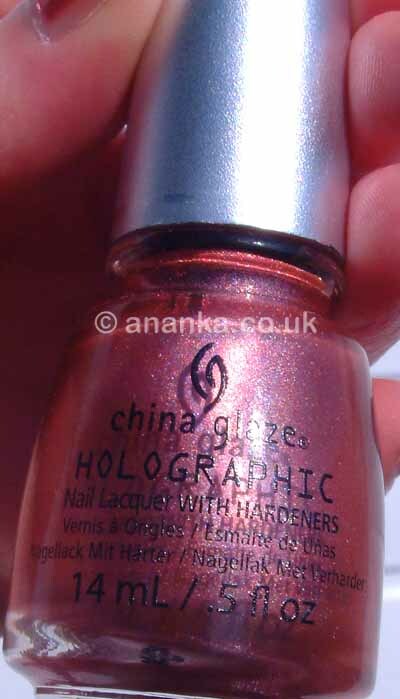 It's a lovely pink holo, but the holo effect is quite subtle. It only really comes out to play in the sunshine. It's very pretty though and lasted well. I used it without the Aqua Base coat. i have this one too and i love it!! It looks kind of brown-ish on my screen but I like it :) The shade isn't obvious and it makes this nail polish interesting. Hehe another untried! You should try it! Well in the last few days it's been raining and no minimal sunshine! Not much chance for a holo really! Their OMG collection is uncountable steps higher, but I've been quite pleased with this collection too. This shade is really lovely! 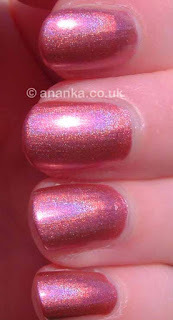 Very pretty shade! not easy to pin down but I like it!